The woman waits in line patiently on her horse before approaching the service window to order. 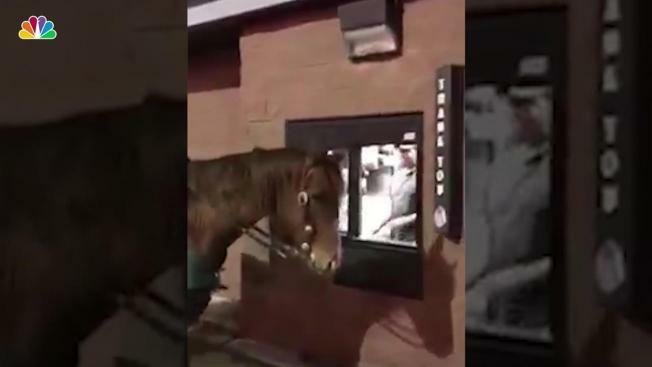 Passersby couldn't believe their eyes when they saw it: a horse waiting patiently in line at the Wendy's drive-thru. A Pennsylvania woman decided to tick off a bucket-list item last month and ride her horse Buns through a drive-thru. Marcella Gruchalak said it had to be a Wendy's. "I thought it would be extra humorous to take him through Wendy's because he’s a red head just like Wendy." Onlookers can't believe what they're seeing as Buns trots up to the service window and his rider orders a chocolate Frosty for him. When Gruchalak is offered a straw with the Frosty, she politely declines, saying Buns probably won't use it. After getting some backlash about the story, the woman who shot the video, Shelly Tate, explained that the horse was safe throughout the video. "Funny bunny B, a.k.a. Buns, and Marcy were asked by my friend Jeff to donate their time for a fundraiser at his club in Dormont benefiting the Children’s Hospital. Everybody at the fundraiser got a thrill to see a horse out in the city and many kids said they have never touched a live horse before, which was very sweet," she said. "On our way home back to the stable Marcy expressed that she always wanted to go through a drive-thru on horses back....so with much consideration we decided to pull over into a well lit and non-heavy traffic area so that she could do this. I monitored the horses safety at all times."